It is astonishing to see how some extremists love to cherry-pick verses out of the Quran in order to support their conclusion that Islam endorses violence against the innocent. Sadly, the ignorant, bigoted folk spew this further to the masses that Islam is a religion of violence. Let’s be clear – Muslims are never ordered to fight against the innocent. Neither the Quran nor the Hadith endorse violence against the innocent. However, as I have examined in many of verses in their historical context, the Quran does allow people to fight back in self-defence, in order to repel oppression, persecution, and tyranny. Related article: Most Misinterpreted Verses Of The Quran? The following verses below are used by critics who espouse that Islam is a religion of violence. I have provided scholarly commentaries on the verses, in order to better understand the verses and clarify them through their historical context. Click on the links for more information. More grease to your elbow, brother! May Almighty Allah reward you with the best both here and hereafter. Ameen. Reblogged this on Giro85's Blog. You accuse Christian ‘extremists’ and ‘Zionists’ of cherry picking verses to make it appear that Islam condones violence, but apparently ignore that devout Muslims and learned scholars take similar views. Your definition of ‘innocents’ is unclear, but many Muslims historically didn’t treat any non-Muslim as being innocent. You say that Muslims can only fight in self defence, but the prophet’s own companions fought aggressive campaigns in the name of their religion against people who had not attacked them. In summary, I applaud your peaceful interpretations. However, people do not regard Islam as a religion of violence and intolerance because of cherry picking by Christian extremists and Zionists. They regard it that way because of the current and historical actions of Muslims acting according to their own beliefs. Further, whilst you make some good arguments, many other Islamic scholars today and historically would come to different conclusions. Your interpretations cannot be clearly and unequivocally regarded as being true Islam. For example, many would regard verse 2:191 as having been abrogated. Brother will you work on the Hadiths which are taken out of Historical background and Context by Christian missionaries who attack Islam? Can I humbly say that it is not Christian missionaries that you need worry about. 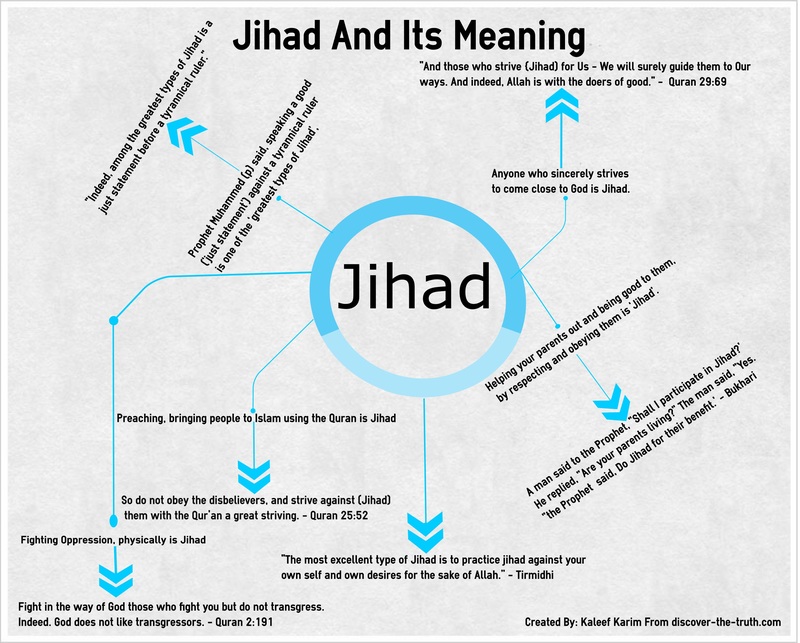 It is people that claim to be Muslims who commit violence and intolerance by taking Hadith out of context. If you can persuade these people, then nobody would take any notice of Christians who would obviously have a partisan view. As it is, the actions of a significant number of Muslims reinforce the missionaries message. It will be impossible to prove them wrong with words alone. However wrong we may think those Muslims are about things, their actions will fatally undermine your words. Can i also humbly request mr Derek that you stop appealing to double standards and outright absurdities.If the criticism of islam is justified by the actions of a little over one percent muslims(a significant number according to your words! ),why not do the same with christianity and even atheism? Afterall,are christians not currently meting out tortures to muslims in C.A.R?Are activities of christian terrorist organizations (such as army of God,priestly phinehas,lord’s resistance army etc) not well-documented (but dismissed as hate crimes)? Indeed, did not europol release a statement which says that 94 percent of terror crimes from the 1970s to date were committed by non-muslims particularly christians? Perhaps i could appeal then to these actions as well cherry picked verses from the bible to dismiss the christian ‘holier than thou’ attitude.Appropriate by your reasoning right? Nonesense by mine i must say. All points you mentioned make some sense, but have some missing dots. Or at some points, i found it hypocritical too. Now lets get example of Battle of Tabook, when Muslim army fought with Persian army. It seems like they attacked Persians, not in self defense but to attack them. Now if we see full story, it started because persians killed messenger sent by Islamic state for an agreement. And according to war laws of that time, if some one kills your messenger sent for some message or agreement, it was considered as open call of War. Thats why the attacked Persians. Same is the case when Salahud-in attacked Crusaders, Crusaders kept on killing pilgrims on their way to perform Hajj, and later they killed the messenger of Salahud-in, who was sent for agreement asking not to harm the pilgrims. Now, getting to the point of history, well yes, there were emperors who kept on attacking lands on the name of Islam, i accept that. But same was true for Hitler, no? did you ever said hitler killed 6 million jews and 5 million non-jews during Holocaust, and we should blame Christianity for that? No! no one said that, dont you think thats hypocrisy? dont you think its dual standards? Same goes with Crusaders invading lands under a cross and so on, i can give 1000z of examples here. I am not here to criticize you or Christianity brother. All i am trying to say it, if a BMW crashes and kills some people. would you blame the driver or BMW? any rational person will blame driver of course. Same is with religion. If some one killed people in the name of religion for his personal matters, its him to get the blame, not religion. I’m hoping this reply goes under Umairs reply otherwise things are gonna get real confusing. Thanks for your reply Umair and thanks for considering my words. Please don’t think I was trying to criticize Islam in comparison to other creeds. I made a statement in my first post about early Muslim rulers attacking others without being first attacked. Abdul took issue with it and asked me to provide some examples. I tried to do this. I think I even said it was not necessarily unjustified. I’ll certainly readily admit that all manner of people have attacked all manner of other people throughout history. More non-Muslim than Muslim. I wasn’t even blaming Islamic teachings for these actions. Whilst I do have some issues with some of the things Islam appears to teach I certainly don’t blame it for all of the actions of every person claiming to be a Muslim. During my discussion with Abdul my actual point has become somewhat lost (Thanks for that Abdul-grr). My point was/is that people in the West take no notice of Christian preachers. If a Christian preacher tells me something about Islam I’d think ‘what does he know’ and probably believe the exact opposite. However if a Muslim tells me something about Islam, or does something and tells me it is because of Islam. I think ‘well he must know what he’s talking about’. I’m much more likely to take him seriously. The same goes for Islamic history. This article was aimed at Christian preachers as though they were the problem causing Islam to be badly thought of. I can tell you they are not a problem you need worry about. (I’d like to reiterate also that I am not a Christian myself). The words and actions of Muslims about Islam will always carry much more weight than those of Christians. The trouble at the moment is that in a room full of people it is the one that shouts loudest that is heard. So the Muslims (if we can even call them that) that say the most hateful things or do the most heinous acts are the ones that influence opinion most. I’m sorry if you thought I was being hypocritical. Abdul (I’m blaming him again, I feel like I’m at school again ‘It wasn’t me Miss, Abdul did it’) thought that the Western media linked Islam with the bad things done in its name whilst not linking bad things done by Christians to Christianity. He thought this was double standards. I tried to point out why I thought this was. I wasn’t blaming Islam for the bad things, merely showing why the Western media links them with Islam and doesn’t link the Christians with Christianity in the same way. Basically most of our discussion is me defending the way the Western media reports things. I know this is a subtle difference and having reread my post I can see why it may appear hypocritical. Abdul has I think missed this subtlety too in his reply to you. I don’t claim that Islam preaches terrorism or encourages it (at least not at the moment, I haven’t fully considered the question yet). I was just pointing out why the Western media links the terrorism to Islam. Abdul thought this linkage unfair if I’m understanding him correctly. Abdul blamed Western foreign policy for the terrorism. I…. Well the discussion is still ongoing I suppose. I’m now faced with replying to Osama Bin Laden’s letter to America. How has that even happened? I’m glad some points made sense, but all? I think you are too kind. It’s so difficult to argue the points without offending or appearing to employ double standards. Abdul thinks it’s unfair for the Western media to label Islam with a problem that is only caused by 1% of the population. I try to defend the media by questioning whether it is 1% and by saying that 1% is still a significant problem so is bound to be widely reported. Abdul laughs at this, I try to back my position with further examples. It’s almost impossible to have this discussion without appearing to be critical of Islam or Muslims. I can only reiterate that I do not blame all Muslims for the actions of a few. I just understand why our media concentrates on the few, they do the things that make the news. I’ll try for a bit longer but I fear it may prove too hard a task. Masha Allah, nice links with clear explanation. However, it would be more attractive to have a few ayats with a brief summary at the top, don’t you think so? Also I would like to bring Quran 60:8 and 60:9 (Sura Mumtahinah) to your notice, these ayats concisely explain practically the whole thing behind what most people misunderstand. Can you elaborate further, thanks for the verse. islam is the complete opposite of the Word of God which is The Lord Jesus Christ, the Son of God. The Word of God is Commandments to Mankind. Found only in the soul of a believer. Follow only the Christ. Read the Bible with faith. All other ways are dead souls. We are in need of resources like this to debunk the rising tide of hate and prejudice, which is too often founded on misinformation and fear. Islam is not a thing to fear. Muslims should be a blessing to their societies. The Quran needs no reform, Muslim hearts and minds, do. There is no compulsion in belief. May Allah (swt) reward you. I’m happy to share this. Thank you for your kind words and sharing it, JZK. Fantastic words bro.Though stupidly arranged and evidenceless as is typical of anti-islamists,got to give kudos to the writer.Never seen such a ‘masterful’ deception. Really?Until you mention such scholars sir,your words can be regarded as no more than unprovable garbage.Robert Spencer (whom you most likely cherry picked this claim from) had a most tough time searching for such scholars.Of course he did find in the but guess who they were? Members of the TALIBAN! ‘But are the talibans not muslims’ you may ask. Sure they are.Just as hitler,john okello and the oklahoma bomber(whose name is now lost to me) were christians! Until you provide a list of such wars,your words require no response. Actions such as yours believe me bro formed part of the reasons why i left the church in early 2011.A liberal glance in the direction of islam and i realized how unfair the globe has been to the noble religion.Everywhere muslims seem tortured by words where action is not possible and vice versa.The rohingya scandal,the plights of muslims in europe,palestine and central africa,massacres of boko haram(an organization based in the country i reside which though claims to be islamic has been responsible for the deaths of Shaykh Jafar Adam,shaykh yusuf danmaishiya,shaykh muhammad auwal albani etc as well as attempts on the lives of Dr Ahmad Gumi and Shaykh Dahiru Usman Bauchi (Waiting to see a pastor on the list!)) are good evidences (even drew tears from my eyes).Sadly however,these terrorisms are given no attention. when of course they are,they are often dismissed as hate crimes. Really felt much for this religion and soon returned to it no less than 3 months after i left it.’Indeed’ i’d told myself after my retaking of the shahada ‘the words of Allah (‘they aspire to put out the light of Allah with their mouths’) have been vindicated.None has ever been more precise in the description of his enemies. Peace to you also my Nigerian co-poster. I was just going to say I felt I was being ganged up on but I notice it’s you replying directly underneath my post as well. Your multitude of responses seem to indicate I have caused you some upset with my words and I apologise if this is the case. This was not my intention. I just wanted to make the point that no amount of bad press from Christians will make much difference to peoples opinions. It is the bad press from the actions of people who say they are Muslims (however misguided they are) that leads people to have bad feelings about Islam. Firstly you have assumed that I am a Christian. I am not. I come from a country that is Christian in background but I have no particular feelings or goodwill to that religion. I’ll try to address the points and criticisms you have made of my post as best as I can. I really, really want to believe that Islam will be a great, peaceful benefit to humanity. My whole purpose in coming to this site in the first place (I was directed here after a very constructive online discussion with a Muslim who was helping me with my concerns) is in trying to convince myself that Islam is indeed this benefit. I would then be able to convince other non Muslims of this, and indeed convince Muslims that take a different message that they are probably wrong and should seek better guidance if the need ever arose. In seeking this guidance I may say things that are offensive or just plain wrong. If this happens can I please apologise in advance. I pose the harshest questions to obtain the best answers. I don’t think I have appealed to double standards, maybe this accusation is from assuming I am a Christian? The one percent figure I am not so sure about. Certainly those doing horrible things is a small percentage but there are quite large minorities of Muslims who support in principle things like violence against civilians (>25% Pew research 2013). Even in my own supposedly tolerant country (I’m from UK) a survey found a third of Muslims here approve of the death penalty for apostates. Even if we say that only 1% of Muslims act on their own extremist views that would be at least 15 million people worldwide. That’s a lot of people, and I do not believe if they were Christians people would ignore them. If anything people here would be even more condemning of Christians behaving like this. They are certainly more critical of Israel. The recent actions in Gaza gained massive coverage and huge condemnation with over 2000 Palestinians killed and that had some defensive arguments to it. Meanwhile the actions of the Sudanese government which over recent years has killed maybe 400,000 and displaced millions through pure aggressive ethnic cleansing get hardly a mention. You make fair points about some groups that call themselves Christian. I don’t think they are anything near the scale of the similar groups claiming Islamic motivations. They also don’t enjoy any support at all from other Christians. The main difference though is that they are not generally motivated by their religious teachings. The Christian militias in CAR came into being to contend with the Muslim dominated seleka coalition that they felt was a threat to them. The French have sent troops to try and protect the people there from each other, there have been atrocities on both sides. The groups like Boko haram, the Taliban, IS, Al shabab’s whole existence is based around their interpretation of Islam and its requirements. Hitler may have been nominally a Christian but in no way did he do what he did because of his devout Christianity. But hey, as I said I’m not here to defend Christianity. I’m here to try and find convincing arguments of Islam’s good intentions for humanity. I think trying to defend actions by pointing out that other actions are just as bad or worse is not particularly useful. I’m not sure about the Europol stats you mention. Did you get them from loonwatch? I think the Euro stats they investigated only covered 2008,9,10. The ones that went back to the 70’s were the FBI ones. They found that only 6% of terrorist attacks were carried out by Muslims. This was not the full story though. Those figures were just for USA. Obviously the Muslim population is small (maybe 1%) and Islamist terrorism against the West is fairly recent so the 6% figure is actually quite large (although probably vastly smaller than most people would expect from the coverage). Also if you consider actual deaths from terrorism you find that something like 98% of US terrorism deaths were caused by Islamist terrorism. I guess as they say you can prove anything with statistics, or even as Vic Reeves once said ‘86.6% of statistics are made up on the spot’. I’m sure you could quote some good stuff from the bible. It wouldn’t mean anything to me. I don’t want to appear ‘holier than thou’ at all. I just want honest answers to the questions and concerns I have. I’m not sure how many characters I get in each post so I’m going to pause for a rest and continue later with your other posts. Really appreciate your zealous and insightful response to my post.Though obviously saddened by the words,i couldnt help admit that they do contain much truth.Pouring over them,i got the impression of an intellectual masqurading behind the veil of impartiality to promote anti-islamism (just an impression mind you.Hardly got a proof). Anyway,will try going over them again with an appeal to reason and evidence (accepting the truths and debunking the falsehoods).Apologising in advance for any rude word/phrase providence may make me appeal to. And guess what?You really have failed to do that.In actual fact,you seem to have done the exact opposite.How do you explain the cheap logic that bad press from bad opinionated journalists to a worse opinionated public(the west is full of anti-saracens who obviously connect everything ‘saracenic’ to islam mind you) only results in…(will leave you to work out the arithmetic).Why such bad press never stirs ill feeling towards the christian and buddhi counterparts is an issue which oughts to provoke thoughts.Could it be because they get good press? Not so quick dear bro.Perhaps the end of my post will make things only worse.Will try to show that you have appealed to triple standard! here approve of the death penalty for apostates. behaving like this. They are certainly more critical of Israel. do what he did because of his devout christianity. Hi again Abdul, I hope it’s OK to call you that. Well, scholars is not particuarly well defined in Islam as far as I can tell. There seem to be a large number of people claiming this title (or cleric, or imam etc.). Probably I should have been more careful with my words. However, I don’t think I need to show that you can go to many mosques throughout the world and hear intolerant views and violence preached. There is plenty of research on this and some undercover reporting too. The leader of IS has a phd in Islamic studies. Not a great scholar by any means, but you won’t have to look too hard to find people who support some level of violence and/or intolerance. You would certainly have to concede that the members of IS (and other violent groups) are extremely devout. They may be very misguided but they genuinely believe they are following Islam and they are devout enough to embrace death based on this. These people have read the same Koran you and I have (probably an awful lot more often). If we are to accuse Christians of cherry picking verses then we must concede that these people do too to justify their violent actions. Abdullah Yusuf Azzam had a doctorate and phd from the prestigious Al-Azhar university. He also lectured in a university in Saudi Arabia. He was known as the father of global jihad and was a founder member of Al Qaeda. He said that non Muslims should be attacked in their own lands once or twice a year, that the scholars agree that offensive Jihad is obligatory until the only religion is for Allah. Most of the ‘hate preachers’ in my country have significant Islamic qualifications. If you look throughout history, particularly at sufi ‘saints’ from the Indian campaigns you will find them glorying in the violence in the name of Allah. I didn’t say that Muslims always treated people badly. The treatment varied considerably. At times the Islamic world was the most peaceful and tolerant in the world, at other times it wasn’t. You say the persecuted Jews invited Muslims to Spain. Maybe, but they were also massacred by Muslims in Spain (look to Granada 1066 or Cordoba as an example). Some rulers tolerated Christians and allowed them to worship as they wished, others destroyed churches, and there were other massacres. Sometimes things changed very rapidly depending on events. When Muslims took Constantinople the warriors were allowed 3 days to do what they liked. They slaughtered anyone they found, at least until they decided that people were worth more alive as slaves. They then destroyed the leading Christian church in the world and turned it into a mosque. The 3 day rule applied in a number of other cities as well. I was referring more to warfare to be honest. Again I’ll mention India as it was probably the most brutal invasion. Whilst Jews and Christians has some protection under dhimmi rules the hindus and buddhists did not. (Incidentally I would not describe the dhimmi rules as being ‘tolerant’). The Indians practically never mounted any attack against the Muslims (certainly not in the beginning) but Muslim armies attacked them, put the men to the sword, destroyed villages and towns and enslaved the women and children. This is not how you treat ‘innocents’ and it was because the Muslims felt that any idolaters and polytheists were not, by definition, ‘innocent’. Now the list of wars. I’ll start with a quote that sums up my point at least. Can’t completely attest to the credibility of the man but he was an adviser to the UN Palesine agency and has written scholarly books. Firstly I have had someone previously tell me that Muslims only fought in self-defence. My opinion is that you cannot gain an empire ranging from the coast of the atlantic to the coast of the bay of bengal and beyond by only fighting defensively. Lets start right at the beginning. Muhammad led caravan raids (Badr). He had his problems with the Meccans but they had not actually attacked. The Banu Nadir did not attack him. The Banu Qurayza did not attack him. There is some vague talk of a broken treaty but no clear evidence of that. If anything, they refused to allow the Meccan army to outflank the Muslim trench position so were an important part of the defence. The Muslims attacked, slaughtered and enslaved these people. Banu Mustaliq did not attack him. Sent army against Christians at Muta, they had not attacked. Sent army to Tabuk on reports of Roman army. Reports were false, still attacked and looted the area. Was not attacked. Some of these had some justification militarily as pre-emptive strikes but even at this point it is not true to say that Muslims only fought strictly in self defence. When Muhammad died some of the Arab tribes drifted away from Islam. Abu Bakr fought the ridda wars to force them back. They did not actually attack. They then attacked Iraq under Khalid-were not attacked. When the Persians did start trying to take their land back the Muslims attacked and took the whole of Persia. I suppose they were attacked in this case, but it was the Persians who struck in defence. The wars continued under the other Caliphs. They attacked the Romans/Byzantines, usually without being attacked themselves. They raided into Turkey, annexed Armenia. A lot of these have some justification. The Muslims were surrounded by powerful nations and maybe felt the need to solidify their position. It isn’t really possible to say they only fought strictly in self defence though. The things that came later were much more clear cut. The invasions of Egypt, Libya and India were motivated purely by the pursuit of wealth and the desire to crush and convert non Muslims. There was no threat or attack from these people. The attacks often resulted in massacres and enslavements. The treatment of India was particularly savage. Time after time jihadic attacks were launched without any provocation. Much of this is quite well recorded, often by Muslim chroniclers. I’ve noticed your third post is not so hard to answer so I’ll have a go at that now. I have been following Boko Haram’s actions. I read an article about how the press jumped all over the Taliban attack on the school in Pakistan, but that Boko Haram have committed lots of those types of attacks on schools in Nigeria and killed more children overall. It is awful and it is a fact that Muslims suffer from Islamist terrorism far more than non Muslims. The UN is weighing in on behalf of the Rohingya at the moment but I can’t say I know enough about all of the history. I don’t think Muslims are in much of a plight in Europe. They are much more secure than in most Muslim countries I think. You finish with a quote from the Koran (9:32 is it?). Looking at 9:31 this seems to be aimed at Christians? Again it is misplaced directing that at me if that is the case. I’m sorry if my post gave you the wrong impression about me. And again that is key part of the point I am making. The people who are extinguishing the light of Allah with their mouths are people like Al Baghdadi who preach violence and hatred in the name of Allah. Christians can say whatever they like about Islamic doctrine, their words will never cause the light to dim as much as this man’s words and the words of people like him. I hope I have not caused you the upset I did earlier. While admittedly much of this is true (thanks for the statistical corrections),i still dont think it provides a sufficient account or answer to the problems associated with the issues at hand.Indeed,when considered in the light of counter evidences,it soon pales into insignificance. 1.The results of surveys (especially non-governmental) are often radically divergent.Too divergent sometimes that they hardly any sense could be made from them.Hence,i really dont accept them as evidence. However,because you have appealed to them,i dont see much sense in outrightly dismissing them.Will have to analyze them. Kill the apostate theory is an issue i’ll not love to touch.Though important,it remains one of much controversy amongst the scholastic circles.Not sure a survey is enough to determine the extent of its acceptance. Wondering though why a mountain had to be made of it.Does not the jewish scripture asserts the same?Why has not much noise been made about its acceptance in the jewish circle?Double standards on the part of the anti-islamist? 2.I find absolutely funny your attempt to make a case out of my 1percent (do i call it) ‘saga’.Dont know how even to begin responding to it.Will perhaps just dismiss it with the words ‘fifteen million out of a billion and half is pretty insignificant.Not good enough to justify a blame tirade upon such an enormous number’. Hello again Sir, Thankyou for taking the time to respond. Next, I get the feeling I am still irritating you. Please believe this is not my intention. I am now a touch irritated too as I feel you have misrepresented my views a bit. I think it’s just a misunderstanding between us though and I’m sure we’ll continue this in a constructive manner. I suppose I should be flattered that you think I may be an ‘intellectual in disguise’. I do have a degree, but it is in Mathematics. In another online conversation I have been having, someone else accused me of something similar. I will copy my response to him so that you can get a better impression of where I am coming from. You may choose not to believe it, but it is the truth and I will feel better for having been completely honest with you. To give some background the discussion was about slavery and the first sentence is because he suggested that I may have approached the Koran with prejudice looking for bad things. “You have got my motivations for reading the Koran almost exactly opposite to the truth. When I decided to read the Koran it was because I was fully expecting to find the much vaunted religion of peace and tolerance. I genuinely believed (and very much hoped) that was what I would find. I was appalled by the negative things sometimes done in Islam’s name, I was appalled by the negativity displayed by some non Muslims. I wanted to be able to have the knowledge to show them how wrong they were. After some initial confusion I soon decided to read it in the order it was revealed (as implied earlier). At first it was okay. I can’t say I liked the overall message which came across to me just as ‘believe or else’ repeated over and over in different ways. Or ‘believe and be rewarded’, ‘disbelieve and be punished’ if you prefer. Once the Medinan verses got going though I didn’t think it was OK. The punishments for not believing began to be implemented by the followers of Islam rather than being left to Allah. I had a reasonably positive view of Islam that I expected to be confirmed by the Koran. I found instead that my view was undermined by it. Since then I have studied other hadith and Islamic history to try and get a clearer picture. I feel there must be something I am missing. As I study I often find that the things that cause me problems are being reinforced rather than corrected. Of course it is not all bad, there are just some bits that are (in my currently held opinion) fundamentally and unavoidably wrong. My whole reason for coming to this page was to find a more positive view of Islam and counter some of the things I have read. It has helped, but it hasn’t completely resolved all of the issues I have by any means. Anyway onto the actual points you have raised. I think to start, an example may make it clearer what my main point is. If a Christian preacher came on TV in my country and said ‘Islam is violent, look at this verse’ I and most people here would dismiss him completely. We would think ‘What a nutjob, I know loads of Muslims and they are great people, not violent at all. He’s just spreading lies to try and persuade people to join his own religion’. However, if Anjem Choudary (obviously a Muslim, however misguided) comes on and says ‘Our book tells us to subdue the infidel’. Then the two blokes that murdered Lee Rigby are seen to justify their actions by quoting from the Koran. We think ‘hang on a minute, that can’t be right’. Then we go and look in the Koran and find it says exactly what they said it did. We start to think ‘Whoa, maybe there is a problem with this religion’. I hope you see what I mean. Whatever the Christian says is practically irrelevant compared to what the others have said and done. It is them misinterpreting verses that is the much bigger problem for people’s perception of Islam. I’m not sure you are correct about the Western press. Our politicians and leaders repeatedly tell us how marvelous and peaceful Islam is and how the people doing violence are nothing to do with it. In general the mainstream press follow this narrative. Sometimes there are silly stories in some of the press but I have never seen an article in the mainstream media criticizing Koranic verses for promoting extremism. A good example is France recently. There were 4 incidents. Two of people carrying weapons (one attacked police officers, one was arrested before he could attack) and two of people driving cars into many pedestrians. In all cases many witnesses reported hearing the men (who were all Muslims) shouting ‘allahu akbar’ whilst carrying out these attacks. Now IS has called for people to carry out attacks exactly like this. How did the French government and press report these incidents? Universally, they denied any terrorist involvement. They said in no way was Islam in any way involved. The men were just mentally ill. The American media has done everything it can to avoid mentioning that the guy who shot the two policemen in New York was a Muslim and had posted a page of the Koran in his final facebook post before heading off to commit the murders. They even described the Fort Hood shootings as ‘workplace violence’ rather than anything to do with Islam. I don’t think these stories would be reported like this if the Western press behaved in the way you portray. There are numerous examples of major American presenters making very savage attacks on Christians. Even Bill Maher (who currently does criticize Islam) started out by attacking and ridiculing Christians. The Western press will obviously concentrate on extremists that threaten Western people. It does not necessarily imply bias. I have seen articles on the Rohinga situation and on the central African one. It is just that they are farther from us and not as threatening to us that they do not get more attention. Now we have numbered points! Thankyou, I should have thought of that. 1/ I agree surveys are not conclusive. I just make (and stand by) the point that views we would regard as extremist (or innapropriate) views are not necessarily limited to 1%. To quote another, 75% of Muslims worldwide wish to implement sharia law. In 2001 the EU court of human rights said that the institution of Sharia law and a theocratic regime, were incompatible with the requirements of a democratic society. I probably prefer what Gulen said about Islam in a democratic society. I don’t support the Iraq war. It was a mistake. I don’t believe that they did it to kill Muslims though. They knew people would suffer and die. They thought it was worth fighting to get rid of a savage dictatorial regime that brutalised the people. I also think they felt bad for leaving the Shia to persecution after the first gulf war after encouraging them to rise up, then abandoned them. Feel free to disagree if you think that was not their motivation (and I’m sure there were other less noble motives too, but making Muslims suffer was not one of them). I suppose we will never know for sure. What I don’t think we can deny is that it was a mistake. I do think there is a small point that they didn’t target civilians. They are just sometimes not careful enough to avoid them. This is in contrast to terrorism which directly targets civilians. I do understand the ‘fighting back in the only way you can’ argument though. I also appreciate your recognition of the work Western journalists do to expose the hypocrisy. The reason nobody makes any issue of the Jewish scriptures call to kill apostates is because no Jew is actually killed for apostacy any more. The Jews have left that teaching behind. It is irrelevant. I take on board that there is controversy on this in Islam but currently you can be killed for leaving Islam and people are. Some countries even have this for a law, and many people live their lives under threat of death from their family members for this. I don’t think I am guilty of double standards here. If anything I think you are. You are trying to criticize Jews for something they don’t do, when it is something that some Muslims do. 2/ 1% is not a large proportion. 15 million is a large number. Currently IS has at most 30,000 members. Look at the damage they cause. Accepting the 1% figure would mean that we could have an organisation the size of IS in the UK just from the extremist Muslims that are here now. I’m sure I don’t need to tell you about the devastation to Islam caused by the mongol armies. They had at most 150,000 people. So your 1% speculation (hopefully it’s much too high) would be enough to make 100 mongol hordes. Of course now they would have modern weapons so could cause even more destruction even more quickly. The total number of all Germans who served in the Wehrmacht in world war 2 was only 20 million. Very few of them were as committed as the extremists. I fully accept that the majority of Muslims are peaceful and wonderful. I do not accept that we can ignore 15 million people who are aggressive, violent, intolerant, fanatically share a common ideology and are willing to die for their beliefs. I don’t mean to blame all Muslims for their actions and I was not intending to launch a ‘tirade’. The words following this were actually talking about Western media again and trying to show how they are more than willing to criticize other groups. I suppose I would summarize with these points. i) The Western press will naturally focus on groups that are a threat to Western people’s safety. That is what most concerns the average person anywhere and the Islamist extremists make direct threats against Western civilians. None of the others do. ii) They also focus on people from their own country. Currently maybe 1000 people have travelled from Britain to fight with IS. More have travelled to other Islamist groups. Nobody has travelled to fight with the Lords resistance army or anyone like it. There could be an anti-Islam bias, I am not seeing it, and some people believe strongly that there is a pro-Islam bias. 3/ Again I was not really talking about the rights and wrongs of the Palestine situation. I was just pointing out how our media is absolutely savage in reporting Israeli actions. I would say that they also under report some justifiable criticism of hamas whose actions regularly harm their own people. Of course we could both have a great time savagely criticizing people from other religions who currently or in the past did great wrong. We could include non religious people too like Stalin or Pol Pot. I’m not employing double standards. It’s just that I am here to speak about what the Koran says and how it is misinterpreted. I made no mention of, or comparison to Christian behaviour in my original post. I didn’t say Christians were any better than Muslims or that Buddhist behaviour is better or anything like that. I was not holding Islam to any other standards than its own. This is because this post and its comments are all about interpretation of Islam! All of the stuff I wrote that did mention Christians was just in response to what you said. You thought that the Western media and Western people ignored their wrongdoing unfairly. I tried to say that I didn’t really agree but tried to find reasons why it may appear that way. Part of the reason for this (and the point I was making) is the difference in recruitment (particularly from the West). No-non Christian I have ever heard of picks up a bible, reads it, then decides ‘I need to go somewhere and kill non believers’. No-one joins a church, gets radicalized, then heads off to join the Lords resistance army. I think maybe that is why the two things are reported differently. I would like to say Peace friend. Let me know how you would take it. While i do appreciate your *early* reply to my post (said early because i have not even completed my response to your earlier post),i’ve got to admit i’m disgusted by your sudden merry-go-round twist.Though your response is scholarly and ‘factful’ as usual,several points in it do seem to undermine what you say is your position.As i do not wish to extend this exchange beyond……(thereby making it boring for keen followers),i’ll not bother making a list.Pray you discover them yourself as the exchange wears on. While i do admit your attempt to free the western media from accusations(of ‘onesidedness’) has got some credibility,i dont think it can serve as a good reason to outrightly dismiss my opinion.Though it is true that they often appear to reject and disconnect islam from extrimists attacks,the ‘overly’ nature of the dismissal coupled the high number of reports seems to suggest they expect the anti-islamic public to read meanings into the reports rather than draw meanings out of them.The public of course somewhat gleans the message and hence,understandingly charge islam with inanities (even assaulting its adherents on not too rare occassions). Glad you say you are british. Will humbly request that you check english reports on Tony Blair’s speech (delievered on 23rd april 2014). Appears you make much of christian-criticizing journalists.Think they are just ‘cant-have-it anymore’ advocates. Bill Maher whom you particularly appeal to isnt a really serious human (he’s a comedian remember).Dont think he expects any christian to get angry at his attacks. Your attempts to make a case out of my 1percent theory is still much a source of amusement to me.While i agree with several of the historical facts you presented,i disagree with your method of presentating them.Did not the 20 million German veterans have the support of hundreds of millions of German as well as Japanese and even french civilians?Indeed,did not the war end when this support waned? That the Fallujah and other tribes are on the frontline against ISIS,that the Tsarnaev brothers were thrown out of the mosque shows that muslim terrorists dont have such kind of support!Their insignificant number hence isnt of any significant consequence. Though you may try making a counter case by assuming some imaginary number of muslims joining ISIS,it wouldnt stand the test of time since more than half (of the caught) of such joiners had already admitted they made mistakes (similar to that the west made mind you).Besides,they are all from anti-muslim west hence their motivation source seems the rampant and increasing anti-islamic bigotry of their region. (They didnt join al-qaeda or boko haram remember). Happy you admitted that the iraqi invasion was a mistake.Though you put up a bizzare defence(one undermined by the fact that rapings and arson are hardly dismissible as indeliberate crimes),got to still say kudos….Will like to bring to your notice though that religious justification of terrorism began in the wake of ‘mistakes’ such as these. Will have loved to respond to the other points of yours in this post.However, appears such isnt possible as my battery’s really down(power outage is still common in Nigeria).Will have to delay until some other time. Firstly you haven’t mentioned my example involving the Christian preacher and Anjem Choudary. Has this example successfully explained my main point that you seemed to take such exception to? Ok look, you are clearly misrepresenting (or misunderstanding) what I am saying. I have made no twists whatsoever. I am not ‘outrightly dismissing’ your opinion. You are entitled to believe what you like. I am equally entitled to disagree. Obviously, I will consider your opinion and also try and point out why I have my opinion, and you are of course free to reject my reasoning and continue with what you think. I thought, as I am actually in the West and exposed to all of its media every single day you may be interested in why I have the view I have. I can see this is not the case, so I will not bother giving you my (clearly much more extensive) experience of the Western media. I’m really not sure how you want the West to report the incidents I mentioned. It seems in your eyes they are damned whatever they do. I will say one thing. If you are going to bring up assaults on Muslims by non Muslims (which are thankfully pretty rare in Europe) then you should also bring up assaults by Muslims on non Muslims. Otherwise you would of course yourself be guilty of the double standards you have so often accused me of. I can’t really comment on Blair’s speech that much. I didn’t take much notice because I hate the man. He is a lying scumbag. How he can be regarded as a ‘middle east peace envoy’ when he joined a war there based on discredited evidence is beyond me. I have briefly looked now of course. I am not sure what your opinion or point is. It seems he wants to combat extremists? Are you proposing just letting them carry on killing and maiming? I thought the whole point of this article is that the extremists are wrong and Islam does not promote violence. Maybe his previous record of violently intervening is the problem? Maybe you have a point there, I could see why that would be of concern. Anyway please follow this link to have some light relief, and maybe a bit of a nudge about how there are always a wide range of views proposed in the West. Maher isn’t the only American critical of the Christians. Nor is it only Americans. I was just giving an example, feel free to continue with your own opinions on this. I’m not going to bother giving you the numerous names of people that stand up for Islam either. The 1939 population of Germany was about 70 million. Not everyone supported the Nazis by any means. They had no material support from Japan and only gained the French support AFTER they had conquered France (this French support was largely forced). The 20 million I quoted was the total enrolled through the entire war. Probably at no one time did they have more than 12 million under arms. They conquered most of Europe and very nearly Russia as well causing maybe 80 million deaths in total and untold destruction. The war didn’t end because the support waned either. It didn’t end until all of Germany had been conquered, the Russians had taken Berlin and Hitler had committed suicide. The people were unable to end the war because the ‘extremist’ leadership were in full control and would violently repress any opposition. I can see clear parallels here with what IS are doing in their areas. You have already alluded to the horror Boko Haram are wreaking on your country. What are their numbers in comparison to the population of Nigeria? Are you seriously just going to ignore them until they just go away? I cannot agree that 15 million people can be just ignored. I am not blaming all Muslims for these people at all. It is in all out interests to overcome the people with this ruinous ideology, ideally by helping Muslims to convince them that they are wrong about Islamic teachings. You are correct that many who join IS discover that they have made a mistake. This does not mean they all stop fighting for them though. The nature of the regime makes it difficult for them to leave. There have been reports of the reluctant being killed, tortured and even tied to tanks to keep them fighting or forced into suicide missions. In fairness, I would also add that some of these people didn’t go to start a repressive caliphate. They went to help the Syrian people fight an oppressive regime. I don’t agree the west is anti-Muslim (as you may have got the impression). To avoid double standards should we also refer to the anti-West Islam? I will take factual issue with a couple of things you said though. By no means are all IS recruits from the West. I’ll give a link (Sorry it’s to a ‘western’ news site-the bbc is pretty impartial though). Foreign fighters make up about a third of IS. France has the highest number from the West, it is 7th on the list and there are more Tunisians than from all Western countries combined. Also, people from the West have certainly joined Al Qaeda in the past. They have also joined Al Shabab and a number of groups based in Pakistan/Afghanistan. I’m not aware of any joining Boko Haram though, I’m sure you are correct about that. Maybe their aims are too limited. Lastly I’m not sure ‘religious terrorism began…’ when you said it did. Were not the Afghanistan (and Iraq really) invasions a reaction to the religiously inspired terrorism of 9/11? Perhaps you are not aware of the 1993 world trade bombing, or the 1994 bombing in Argentina. I do agree that the invasions have increased radicalisation and that is one of the reasons why the Iraq war in particular was so stupid. Interestingly some radicalised Westerners do cite the intervention in Iraq as reason to hate the West. But then they also cite the lack of intervention in Syria. They can’t have it both ways surely. Again, what is the West actually supposed to do? I am certainly not going to defend criminal acts by Western soldiers. I don’t want to downplay atrocities, but holding the entire West (or even the entire Western military) responsible for this is just as bad as a non Muslim holding all Muslims responsible for terrorism isn’t it? Isn’t this double standards again? I would also point out that other Western soldiers brought these incidents to attention and that these people are prosecuted and punished for these crimes. Overall you would probably find that modern Western soldiers behave better than most throughout history in a war situation. There are of course exceptions and we must harshly deal with them and do everything we can to prevent them happening. You asked me to quote scholars who endorse violence. I responded to this by admitting that I should have chosen my words more carefully. I noted that scholar is a somewhat loose term and many claim this title (or cleric, or imam), not always with good credentials. Anyway I then pointed out that Al Baghdadi is a scholar of sorts (phd in islamic studies) and he clearly endorses violence. Most of the ‘hate preachers’ in my own country have some level of qualification. Of course if you look at historic scholars there are many more, even some ‘sufi saints’. Maybe Qutb would fit your requirements? I went on to say that even if you reject the scholars I named you can hear intolerance, hatred and violence preached in many mosques. If you insist on evidence I would refer you to the Channel 4 dispatches program ‘undercover mosque’ (there is plenty of other evidence available). I’m surprised that you challenged the point to be honest. I didn’t think it was particularly controversial. There are many misguided people in the world. I then responded to your list of times Muslims treated others very well. I agreed and pointed out that I didn’t say they always treated them badly and that at times Muslim lands were the most tolerant places in the world. I then pointed out that this wasn’t always the case and gave some examples. I also pointed out a difference between the general treatment of Christians and Jews (subject to dhimmi rules-which I did not regard as truly tolerant) and that of Hindus and Buddhists (not eligible for dhimmi rules). I gave the opinion that Muslims treated these people as polytheists and idol worshippers and therefore automatically not ‘innocent’. I then gave a list of early Muslim confrontations that I felt could not really be described as self defence. I think this may be where I fell foul of the moderation. I probably questioned some of the prophet’s actions too strongly. Again I was surprised that you challenged the point, and I gave the opinion that no nation could gain an empire from the Atlantic coast of Africa to the Bay of Bengal simply by defending itself. Anyway I began with a quote from a Muslim. Anyway, skipping past the prophet’s campaigns this time. Abu Bakr conducted the ridda wars. Most (if not all) of the time he was not actually attacked. Khalid attacked into Iraq – wasn’t attacked. Romans were then attacked – they didn’t attack first. These large nations did respond of course and the Muslim nation responded back again. They later raided into Turkey without having been attacked, annexed Armenia without being attacked. I made the point that there was some justification to these battles. Islam was surrounded by powerful empires that could at any time decide to try and crush it. Maybe there was an element of pre-emptive strike about things. I don’t think it can be said that they only struck in self defence though, even at this early stage. I then went on to suggest that the later invasions of Egypt, Libya and India has no self defence justification to them at all. India was repeatedly subjected to waves of jihadic invaders that were almost never proceeded by even the remote possibility of any attack. I pointed out that a lot of these events are quite well recorded by Muslim chroniclers. If you want more detail I suggest you use wikipedia. The information is all there with verifiable references. You are free to reject my words and explanations of course. I only try to answer your challenge. If you think I fall short then so be it. I then sympathised with you over the actions of Boko Haram of which I am of course aware. I had some criticism for our media in comparing the coverage of the Taliban massacre of schoolchildren in Pakistan with the lack of coverage of BH school attacks (I think they have killed many more, only spread out over more incidents). I expressed my opinion that most Muslims in Western countries were not really in much of a ‘plight’ and that those in Muslim countries were mostly in more of a ‘plight’. Lastly I made use of your Koran quote to say that I thought that the words and actions of people like al Baghdadi diminish Islams light far more than any Christian preacher’s words ever could. Which is again of course my main point. Its fine to disagree with this of course, but hopefully you can at least see my point of view on that. Well I’m all caught up now. I hope the power situation improves for you. While I do admit that i’d probably been too conclusive in my harsh criticism of the western media,i dont really think you have provided any convincing counter point to prove that i was wrong.Though your defences are fair,considered in the light of the (further) points of mine,they carry no meaningful weight. While your latest words seem to suggest i’m somehow unqualified to assess the western media,i appreciate the fact that you indirectly asked me how i think they should present their reports.Perhaps will have to say kudos. Anyway,the way forward is not really difficult.In my opinion,all that needs to be done is give equal publicity to terror attacks (rather than high and sometimes exaggerated accounts of islamic terrorism accompanied by only dismissal),deny audience to cheap islamophobes,publicize attempts of muslims (and non-muslims) to enforce and establish peace(by appealing to muslim offers to guard churches and other innumerable instances),denounce dismissal of non-muslim terror acts as mere hate crimes(rarely making religion seem responsible while doing the opposite to muslim ones) and finally (and most importantly) portray to the public the danger of attacks to both the muslim as well as the non-muslim. These i believe will sow some seed of guilt in both factions while laying a strong foundation towards unity enhancement. Ever wonder why Nigerian islamophobes(such as Rev G.J.O Moshay) hardly ever appeal to facts from the Nigerian media?…Well,you seem to have gotten it correct.The Nigerian media has done very well in ‘practicalising’ all the points i listed above hence appearing (albeit by my standards) a success story compared to its western counterpart. Perhaps i was wrong not to really have questioned and request for the reasons why you took the position you defend,i guess i shouldnt be blamed much.Thought that was what you’d been trying to explain all along. Your appeal to it however seem to suggest there’s more to it than i earlier thought.Will therefore plead for another chance.Promise to be more than a willing pupil if my plea is accepted. Your claim that you do not understand my motive for asking you to check reports into Mr Blair’s speech stunned me beyond explanation.I was so shocked that for minutes,i could hardly move.Though it serves an evidence for ‘misundertandment’,i obviously will not be put away by it.Of course you hate him (as do many brits(appealed to him due to that in the first place! )),the media (well aware of it) exploited it by publicizing his speech(which it is glaringly obvious will only provoke public outrage and afford anti-islamists another chance to launch an attack…indeed it did for a site autor wrote ‘he loves islam.Perhaps only just realized islam doesnt love him’…. ).My overall purpose hence was to strengthen my position.Meanings are expected to be read into reports than being drawn out of it! Please continue. I’ll hold off until you’ve finished (and I need my beauty sleep just now-desperately). Thanks for the more positive tone. Of course you are also qualified to have an opinion on the Western media, I didn’t wish to imply otherwise, I just thought I may have a fuller picture or possibly be aware of some things you were not (and of course we don’t have to agree). I certainly have no meaningful knowledge of the Nigerian media and will have to bow to your expertise in that area. Am happy to discuss the media obviously, although I’m not even really sure how we got onto it now. It seems a little off the point of my original post that you reacted strongly to. While i do thank you bro for your kind words above,i have to admit i’m most undeserving of them.Though they surely did raise my spirits,it would seem…………Will therefore proceed with my response pretending not to have seen them. Whether there are a thousand other westeners besides Maher wouldn’t really affect my argument. Indeed,i haven’t denied their presence,have i? Called them ‘can’t-have-it-anymore advocates’ remember. Don’t understand the difference you seem to be implying when you talked of ‘christian-criticizing journalists’ and their ‘islam-defending’ counterparts.Perhaps you’d be generous explaining it.Both seem pretty on the same page to me. I find it a little strange that my 1percent theory still makes a case to you.Though it obviously isnt funny anymore,i’d still call it a joke.Perhaps it is one of the positions we’d probably never agree on. 1.Though Japan didnt materially support hitler during the war,it (as my kinsmen say) offered him with the right what it denied him with the left.Was Japan not instrumental in the capture of Vietnam and Indonesia (a move which saw millions being forced into supporting hitler)?Did it not attack(and capture) dutch colonies (and french when france finally joined the allied forces)?Indeed,these feats distracted and disrupted much of the forces hence made the German nazi and Italian fascist(plus other forced albeit feeble) armies prove formidable. 2.While the 2nd world war appears to be one which involves the whole world(minus few indifferent nations) vs Germany,Italy and their cohorts,an insightful look into the course of events explains why it lingered for long.Most nations joined (as wikipedia ‘which you appear to respect’ puts it) at the eleventh hour! 3.While i do not know the true total of the Nazi-Fascist army that began the war,i dont think it could be less than 20percent the allied forces(too high to be dismissed).Perhaps it accounted for too far less than that in the face of world army hence its defeat. Of course the war ended because support waned.Okinawa had been invaded,Heroshima and Nagasaki had been bombed,gone was Japan’s support(and with it millions of forced support),Italy had faded into anonimity(‘taken its square root’ as we say),France had long joined the opponents, and the heroic Germans were turning against the government. You painted the image of the end yourself.Dont think i need broach it again. I fear i write too many long *nonsense* which might get moderated away.Promise to respond to other points in a new post. I’m not sure if I should reply to what you have put so far now, or wait until you have addressed all the points you wish to, then do it all in one big go? Just a quick answer to a question you posed. I know you have raised the issue of anti-Islam correspondents in the media. I just wanted to assure you that there were plenty of pro-Islam correspondents also. There are plenty of people that stick up for Islam and even other people that attack the critics just for being too critical. No particularly important point was meant. Just ignore it if it’s not helpful. I have developed a bit of a theory that may explain (a little) why our views of the Western media are somewhat different. I’ll wait a while longer for now. By the way, I asked a Nigerian colleague of mine if she knew Kaduna. She said it was a lovely place with wonderful (not always too hot) weather. She also said it was wealthy and full of posh houses. Do you live in a posh house Abdul? I am imagining you living the life of luxury, next to your swimming pool with a serving girl massaging your feet whilst another feeds you grapes while you prepare these conversations for me. Please don’t ruin the illusion! Firstly wish to begin by pleading for pardon for inability to respond early.Really neck deep in some troubles. Though i did try,i somehow lost it (perhaps as a result of some folly on my part). 1.I began by attacking your Anjem Chaudry appeal.Though i admitted it’ll be pretty difficult to defend him,i pointed out that the facts that he propagates the ‘it is forbidden to attack peaceful unbelievers under a covenant’ and above all comfortably saw off an islamophobe (probably David Wood) in the debate ‘is islam a threat to the west’ depict a broader image than you are trying to portray. 2.Next,i moved on to the unconcluded ISIS……While i admittedly spent considerable time on rampage trying to disprove your stats,i eventually succumbed to them saying my points were not satisfactory enough.I especially applauded your sense of honesty for admitting that several factors(such as fighting an oppressive regime and indeed poverty,unemployment,desire for revenge etc) were well responsible. Somehow however,i felt you didnt tell the whole story hence alluded to the interview of an ex-terrorist(aired on an Egyptian channel) in which he claimed that the organization is an Israeli founded one created to cause more pandemonium in the Islamic world.’Its leader’ he had said ‘is Simon Elliot rather than Abubakar Baghdadi’. 3.I lashed out at your challenge of my words ‘justification of islamic terrorism began in the wake of western mistakes’. ‘It is bizzare’ i’d said ‘pathetic and presents more problems than it appears to solve’. Though there had undeniably been bombings in 1993 and 1994,it appears they were motivated by hate rather than theology.Occurences such as the killing of 1000 muslim anti-Assad protesters,massacre of worshippers in Sri Lanka,genocide of Bosnia,continous attacks in palestine etc(actions which the western super powers either supported or ignored) are excellent examples. a.unproven but indismissable evidences pointing to support from top profile figures (such as Jerry Gana,Pastor Ayo Oritsejafor,Modu Ali Sherrif,Aliyu Ndume and the offices of the presidents of Nigeria and the Republic Of Chad). Go ahead bro and burst.Just pray you’d be wise enough to reserve some energy so as to pull yourself together again when ‘the deed is killed’. 6.I challenged your criticism of the ‘intervene-in-syria’ journalists.Though i admitted i wouldn’t accept their view,i claimed they’re not very far off the mark.Western intervention in the first place was what brought about the present chaos in the islamic world (as has been admitted by several five star generals).Hence,abandoning them at the most crucial period is not justified by even the most lowly standards. ‘The mother of betrayals’ my girlfriend calls it (*girlfriend* not in the western sense mind you). 7.I accepted your claim that western soldiers are better than several who ‘have seen action’. ‘However’ i pointed out ‘they seem a little less disciplined than many others and are often involved in horrible unimaginable atrocities that is difficult to attribute to even the most primitive animals of the world’.Dont blame easterners for hating them at all. 8.I commended Dr Issa Othman for his words.’It contains much truth’ i’d said ‘and presents a lot to quite think about’. However,i disagreed with your application of it and reasoned that by your words,an ‘apology’ crusade oughts to be launched by every human to his……Atheists will have to apologise for the ‘travails’ of religious adherents under Stalin and his cohorts.Christians,on the other hand have to apologise for the forced conversion of Indigenes of Northern Netherlands and tortures of jews under the visogoths. Muslims of course will not be exempted and must have to apologise for the conquests of Danfodio and invasion of Armenia.Hindus and buddhists perhaps to apologise for the bombings of LTTE and Rohingya scandal respectively etc….Dont think this is even half possible in the present world. ‘All you laid down’ i’d went on ‘can be well classified as a product of any of the above reasons save THEOLOGY and perhaps greed.Armenia,Egypt and Libya were invaded because they were annexes of Byzantium (a neccessity as it became increasingly obvious that the ‘cornered’ Romans might use them to create rancour),Syria and Iraq got trampled upon for attempts to form alliance with the *murtaddeen* (an act which definately points to intention of future raids),India was repeatedly attacked probably on accounts of torture of muslims (an act which though unproven cannot be dismissed and appears strongly supported by the forced exile of hindu-turn-muslim Chera king Cheruman Peralman (aka Chakrawati Farmas).Earliest dawagandists appeared peacefully on the coasts of Malabar remember),Spain was raked into the empire on invitation by tortured jews,Vienna and France were attacked by muslims bearing disgust for Europe on account of the attrocities of the crusades…..on and on goes the list’. Sealing it,i called you out to explain the seeming double standards in assuming islam responsible for invasions while attempting to free christrianity and others from same. 11.I dismissed your appeal to Qutb and Azzam by saying their views were motivated by hatred for the west.Qutb in particular underwent spiritual crisis in America and unsurprisingly went to Egypt to become an outspoken anti-west advocate.His commentary on the quran (classified as tafsir bil ra’y) is a good reflection of this. Azzam’s case isnt any different.His partner Osama Bn Laden pretty sums up everything in his ‘message to America’ (the link of which i provided above). Dont know the Baghdadi you spoke about.Not sure he’ll be any different from his companions above. Thus far you have failed to make a meaningful case.Dont think it’s sensible to persist.Waiting to see your rebuttal though. Leave with the usual words. I have quite a bit to say so to make it clearer I’m going to split it into 3 parts. Part 1 will be an attempt to bring the discussion back to the original point(s) of my original post that caused you to react so strongly, and also address your most recent points. Part 2 I will have a look at some of the side issues that we disagree on. Part 3 I will tackle the remaining issues that aren’t really very important to what we are discussing but where our views again are at odds. With Umairs intervention above I realise that it can seem that I am comparing Islam and Muslims with other religions and peoples. This is not really what I want to do. It’s hard to completely avoid this when I am trying to defend the reporting of the Western media from accusations of one-sidedness. Please believe that I am not blaming Islam or all Muslims for the actions of a few. Nor do I mean to praise any other people in comparison. I hope that those that take the time to read this can at least see why I have my point of view. This might not the best forum to look for support for my opinions but I can hope that some can find some small value in some of them. To start I would like to go back to the whole point of this article. Showing that Islam (and the Quran in particular) does not promote violence. I was somewhat perturbed that you referred to OBL’s letter to America. I hadn’t read it before (and will speak about it later). I know you brought it up to talk about the justification for terrorism but I have to point out that the very first thing he does in this letter is use the Quran to endorse violence. The fact that you use the word ‘brilliantly’ for this letter leads me to question if you do actually think that the Quran does not promote violence. I didn’t really appeal to Anjem Choudhary, I just picked his name off the top of my head as someone who says things about Islam that Westerners would have a problem with. I could have chosen any number of people. However, you then talk about a debate he had with David Wood (you celebrate his ‘victory’, I may have a look at that later too), and point out that he said ‘it is forbidden to attack peaceful unbelievers under a covenant’. Well of course this qualification implies that it is fine to attack people you do not have a covenant with. One of the few things that Choudhary and Wood would probably both agree on is that the Quran does endorse violence (in some cases). Exactly what we are trying to show is not the case. Now on to my original point that I would like to get back to. My main point was about the lack of influence of Christian preachers on people’s opinions of Islam compared to the influence of people claiming to be Muslim (maybe I should have specified ‘in the West’ here-I don’t know what sort of influence Christian preachers have elsewhere). I can’t really add anything to this. I can’t explain what I meant any better. I’ll just have to leave you to decide for yourself if there is any value to what I say. 1/ Devout Muslims and learned scholars also think that the Quran endorses violence. We’ve have some discussion about this. In your more recent points you seem to be tending towards the view that some scholars do use the Quran to endorse violence but that it is other factors (such as their hatred of the West) that causes them to do this. Well, they may well have great reasons. But that doesn’t actually affect my point. They do (I am not saying they are correct in this). That was my only point. I’m sorry if I’ve misrepresented what you’ve said here, that was just the impression I was getting. As I said, people actually blow themselves up to harm others because they think the Quran endorses this. You would have to be pretty devout to do this. I hope we can agree they are misguided in this, particularly when they attack civilians. 2/ Historically Muslims didn’t treat non Muslims as innocents. We didn’t really discuss this much. It sort of merged with the one below. I think it is fairly clear that Muslims should not conduct violence on innocents. So if we can see that they have attacked people who we could argue were innocent of any crime, then we have to assume that they did not treat them as innocents for some other reason. In point 9 above you give reasons why this may have happened. I do not dispute that there were reasons of varying reasonableness for these actions. I just said that it happened. You appear to admit that the claim has at least some truth to it. In summary, I don’t think we are really disagreeing all that much about these points I made. I know you reacted strongly to them at first but I’m not sure where you think I am wrong. Maybe it is just because I am only talking about Islam here? You don’t think I condemn others enough? I have to reiterate that I am here to talk about the Quran and its interpretation. Obviously if I was communicating under an article saying ‘reasons why the Bible doesn’t justify violence’ then I would be talking about that instead. I would be saying that it doesn’t matter what Imam’s say about Christianity. It matters what people like the Jesuits did. I would be telling them to convince their fellow Christians that do horrible things before worrying about what a Muslim says. Equally obviously, the discussion led on to many other things. I’ll try and answer your recent (numbered) points. 1/ I’ve already talked about Choudhary, maybe more later. I’m glad that you may find it hard to defend him on some things. I don’t disagree that other people have done terrible things. (Pope Sylvester 2? Maybe Pope Urban 2? I’m pretty sure I know what you’re talking about). I think all we are really arguing about is the attributed cause of these acts in the media. More on the media later. 2/ I find the conspiracy theories about ISIS implausible. At first I saw some Muslims saying ‘Oh, the media is unfairly portraying them, they are actually doing wonderful things. They are in full accordance with Islam. The bad press they get is a Western conspiracy against Islam’. Of course even this doesn’t explain why so many Muslims join them either. They seem to genuinely think they are acting in accordance with teachings. They can’t all be Mossad agents surely? 3/ Here I think we are talking about the current terrorists attacks on the West. I’ll try and give you my opinion on ‘letter to America’ later. I would go back much further for the roots of terrorism in an Islamic context. I would also be careful to point out (I’ve learned my lesson a bit) that many different peoples have used terrorism in various ways and with various justifications throughout history. Anyway, the Kharijites were apparently practicing religiously inspired terrorism as early as 650CE. Muhammad himself is recorded as having said ‘I have been made victorious with terror’. I know the current actions against the West are blamed on the West. But most of the terror is practiced on other Muslims. They still justify it using Islamic teachings and this is what the media reports. 4/ You know more about BH than me. Whilst I naturally tend to reject conspiracy theories all I really want to show is that they are a problem. If you don’t agree then we will just have to disagree I think. Yes, and I think the US is realising it needs to try and help solve the mess they helped create. It’s difficult to predict the future, I think the US thought they had given Iraq a great chance. It was always a balancing act. Their presence there provided some security, but also provoked anger and encouraged violence. If the Iraqi government could have been more inclusive then these problems could have been avoided. It is not all the West’s fault. If I’m being harsh I would say that some of these Muslims need to take responsibility for their own actions rather than blaming the West for absolutely everything. 7/ I think we can both leave this one with what we both have already said. 8/ I am not supporting any of the people you here condemn and they should all apologise. 9/ I’m not sure I have tried to absolve Christianity or others from blame of invasions? Of course there are many reasons for the original Islamic invasions, but I do think that Islamic teachings (as then interpreted) was a big one of them. I’m certainly not saying that nobody else ever conducted invasions either. Whatever their motivations, all I am trying to say is that they use the Quran to endorse violence. We can say they are wrong to do this. I still think they do it. 12/ I don’t think I accused you of challenging undercover mosque. I just wanted to make sure you were aware of it as evidence of Muslims who preach hate to back up my point that there are such people. I’m not sure what meaningful case you are referring to when you say I have not made it. We are talking about so many different things. My main focus is on my initial post, do you at least understand my point of view on that? Whether or not you agree. Though i’d say bro Umair that your points are brilliantly put,they appear to portray you as someone who has missed the point.Derek’s arguements were not that islam preaches terrorism.Rather,it is that it encourages it (since it’s often the source of inspiration of terrorists). 2.Supposed islamic terrorism basically stemmed from hatred for the west. These essentially have been the main points of the exchange.Think you need to read it.Will obviously provide you more knowledge. Can i humbly request mr admin that you place my words to bro Umair in its appropriate place (i.e immediately below his comment)?